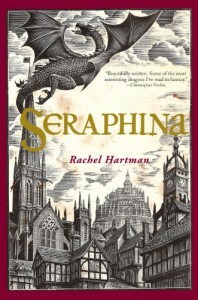 Seraphina was very different than what I had imagined but I enjoyed it none the less. It was very similar to the Legacy in writing style and world building. It took a fantasy world and portrayed such realism that you could imagine dragons walking the streets as people. The plot istelf was vastly different however. I could see how some would find this tale boring as a lot of instances had no specific plot purpose other than world building but personally I didn't mind it. The plot held a lot of surprises and I enjoyed the direction it went immensely. The characters themselves really surprised me. I only felt really attached to Seraphina and Orma however all the characters were entertaining. I enjoyed that the love was slow in coming and actually looked at and handled by the characters in a sensible light. I can not wait to dive back in to Seraphina's world in the sequel! I recommened this book to fantasy lovers.